The I Give To You Violin! This Violin was used in the make of Nitzer Ebb’s music video I Give To You! Information by Bon Harris: As for info on it, there were, I think, six that were custom made for the I Give To You video directed by Angela Conway and Anton Corbjin’s production company STATE. I’d expressed an interest in them at the shoot, as they looked really good and Angela said we could take one if we wanted. I picked that one out and had it on the wall in my house until I moved to the USA, and it went into storage. Not sure what happened to the other five. The Violin is donated by Nitzer Ebb to support www.fightthecancer.nitzer-ebb.de, a fundraiser created by Stefan Albinsson. The cancer research fundraiser is a part of Stefan Albinsson’s Livestrong fundraiser for the New York City Marathon 2011. All money raised supports this important cause. The fundraiser is doing awesome almost 2000 $ now. These two passes was donated by Julian Beeston, Ex-Drummer and member of the 1990 Nitzer Ebb Band Line Up to support Depeche Mode’s World Violation Tour – USA Leg. The black pass is signed by Julian Beeston! The cancer research fundraiser is a part of Stefan Albinsson’s Livestrong fundraiser for the New York City Marathon 2011. All money raised supports this important cause. Please place your bid on ebay! This is the second out of four and this are as original as it can get! All money goes to Cancer research! The cancer research fundraiser is a part of Stefan Albinsson’s Livestrong fundraiser for the New York City Marathon 2011. All money raised supports this important cause. 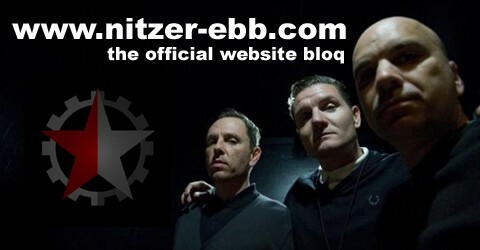 Nitzer Ebb Big Hit Art Work, this is the first one out of four. Word from artist David Gooday (original member of Nitzer Ebb): This is concept drawings in different mediums through to the original acrylic before it went onto the canvas, but this are as original as it can get! All money goes to Cancer research!